August 2012 saw Death Abyss spreading his doctrine to like-minded artists (Inigo Kennedy, Makaton, Mark Broom, Israel Vines and Tomohiko Sagae) with their ‘Dominate Through Will Remixes’ on Rodz-Konez (MAK035). 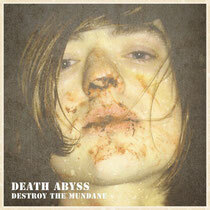 Now, Death Abyss himself is back in September with 'Destroy The Mundane', a brand new three-tracker aimed to leave you shaking in your boots. First up is title track, ‘Destroy the Mundane’. This powerful industrial fiend is ready to slay the faint-hearted and deposit some darkness into your soul. There’s no let-up on ‘Fill Your Heart with Hate’, as the hammer comes down to pound on the musical anvil of this hell-like landscape. ‘Morality Is A Handicap’ is the final cut with its reversed-style beats. Out now on Rodz-Konez (MAK036). Check it out below.